Reclaimed water is safe for non-potable uses such as industrial cooling and irrigation. Reclaimed water is continuously monitored and tested to ensure that its quality meets Level 1 standards, the highest level quality designation. 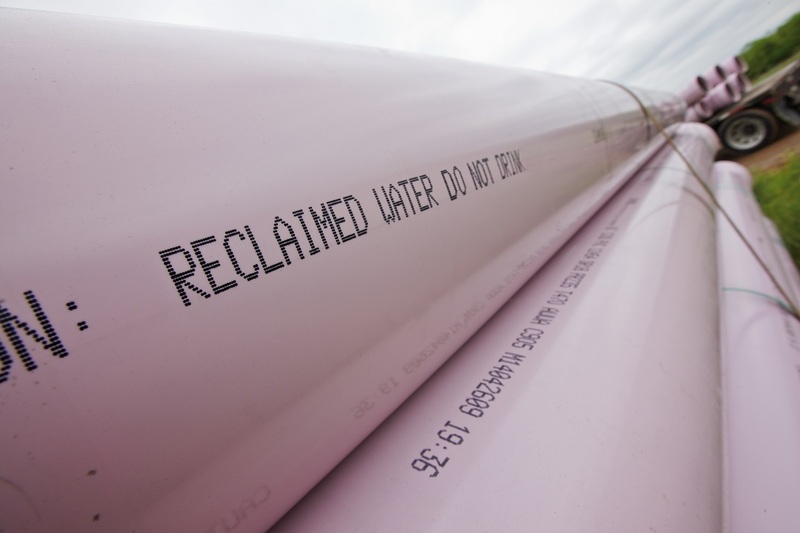 For new construction or retrofitting, approved construction plans and valid permits are needed to connect to the reclaimed water system. Loudoun Water engineers are available to guide customers through the connection process and to provide additional information on special requirements, including signage, labeling, and backflow prevention. Learn more about connecting your new development to reclaimed water service. Reclaimed water may also be used for a variety of construction purposes such as truck wash, dust control, and concrete mixing. Committed to innovative resource management, in 2010 Loudoun Water constructed the first pipelines of a new reclaimed water distribution system to supply irrigation and industrial cooling water to Loudoun County’s rapidly growing data center industry. The reclaimed water distribution system has since expanded to 14 miles of pipeline and serves 30 facilities. In 2017, Loudoun Water delivered 475 million gallons of reclaimed water to its customers, helping to save an equal amount of precious potable drinking water while reducing nutrients discharged to the Potomac River and Chesapeake Bay. Loudoun Water’s Broad Run Water Reclamation Facility is capable of serving up to 6 million gallons of reclaimed water to our customers every day. If you would like a tour of Broad Run Water Reclamation Facility, please send an email to Micah Vieux, Business Programs Manager. In the Fall of each year Loudoun Water service crews flush the reclaimed water distribution system and perform routine maintenance and inspections on hydrants, valves, and other appurtenances. Flushing the reclaimed water system helps to ensure the best possible water quality for our customers. Reclaimed water customers are given advanced notice of flushing and maintenance activities. Strong communication with our stakeholders helps ensure efficient field work that minimizes impacts to business. Virginia DEQ regulates the production and use of reclaimed water. Loudoun Water submits monthly reports on reclaimed water quality and consumption to Virginia DEQ. Water quality information is available by request. If you would like reclaimed water quality information, then please email Micah Vieux, Program Development Manager.